Steven B. Reale is Assistant Professor of Music specializing in Music Theory at Youngstown State University in Youngstown, OH. Auf den ersten Blick ist Katamari Damacy (Namco, 2004) ein simples und heiteres Computerspiel. Dennoch steckt es voller thematischer Verwicklungen und Komplikationen, die eine Reihe von ethischen und ästhetischen Fragen aufwerfen, beispielsweise die Beziehung von Kindheit und Schrecken, zwischen Vater und Sohn sowie von digital und analog; darüber hinaus werden all die Verwicklungen, die diese Paarungen bestimmen, geschickt von der Musik des Spiels unterstrichen. Der Artikel spürt einem musikalischen Thema nach, welches als idée fixe des Spiels fungiert und im Verlauf mehrerer Levels des Spiels musikalisch umgestaltet wird. Weil die Musik das Potenzial besitzt die Spielerperformance zu beeinflussen, kann selbst non-diegetische, nicht-dynamische Computerspielmusik tiefgreifend andere Funktionen haben als non-diegetische Filmmusik. At first glance, Katamari Damacy (Namco, 2004) is a simple and cheery video game. Yet the game is full of thematic complexities and complications, which raise a number of ethical and aesthetic problems, including the relationships between childhood and terror, father and son, and digital and analog; furthermore, the complexities governing each of these pairs are cleverly underscored by the game's music. The article traces a musical theme that serves as the game's idée fixe which is transformed in the music across several of the game's levels. Because the music has the potential to affect player performance, even non-diegetic, non-dynamic video game music can serve profoundly different functions than non-diegetic film music. It was indeed not a dream. We really did it. The King of All Cosmos has really done it. but We were in all Nature's embrace. We felt the beauty of all things, and felt love for all. We smiled a genuine smile. Did you see? The stars splintering in perfect beauty. So many there used to be, almost a nuisance. Now there's nothing but darkness. Hee… But a beautiful one. That miraculous fabulous moment has passed, it's over. We came to and found everyone furious. Even the King of All Cosmos was not spared their wrath. Hurry up and bring back the glorious starry sky. Our problem, your problem. Yes? You owe Us your existence, We collect on the debt. Yes? Hand in hand, always there. Yes? The very definition of the father-son bond. Yes? There is a rich network of meaning and association in the King's opening monologue. Through his rhetorical references to waking from a "beautiful dream," which he cannot "remember very clearly" except having been in "all Nature's embrace," as well as his curious typographical use of ♥, we can infer that the destruction of the heavens was the result of some form of intoxication. Furthermore, as the terrible consequences become apparent in the morning light, the King shifts responsibility to the Prince. In a nightmare of Freudian proportions, the enormous King, an uncomfortable impression of excessive genitalia on display, towers over the minuscule Prince and reminds him of his small stature and the "debt" he owes to the King for his life. It is difficult to avoid the suspicion that the royal home life is abusive. Over the course of the game, the King's behavior toward the Prince is neglectful at best. Before the first level begins, the King expresses surprise at how small the Prince is, indicating that he has altogether forgotten what the Prince looks like. "That body, that physique," he remarks, "Could you really be Our son?" The King decides that rolling up katamaris will provide good exercise to help him bulk up: "Don't presume to take the escalator up to the throne just because you're the Prince." The King then asks the Prince to create a ten centimeter katamari, and the level begins. Several minutes later, after the Prince has finished the task, the King returns, notices the katamari with surprise and remarks, "We'd forgotten all about that." The King continually dashes the Prince's attempts to live up to his expectations and gain his approval. Even when the player successfully completes a level and creates a katamari of the requested size, the King usually remains unimpressed and remarks on how small, dull, or unappealing the new star is and insinuates that the Prince has no work ethic and is satisfied with doing little more than the bare minimum asked of him. "It was the first goal," the King remarks, "but it's not very exciting, is it? Next time, We want a much bigger one," thereby dismissing outright the hard work the Prince did to help repair the damage he had caused. When the player is unsuccessful at completing a level, the King towers above and berates the Prince, who falls to his knees and sobs as a torrential storm rains on his head: "It was not your fault. It was Our fault for believing in you." The space is dark and the only visible part of the King is his head. Occasional lightning bolts backlight the rest of the King's body, revealing threatening postures such as arms angrily folded, arms outstretched with claws instead of hands, arms outstretched within a Draculean cape, or the silhouette of an absent body—a mere skeleton. A kawaii aesthetic also informs the second main story of the game, which follows the Hoshino family. The mother and children are travelling to a space center to watch the father, an astronaut, blast off in a rocket for the moon. The story is told through a series of brief animations that appear between levels. The heads and bodies of the people are Lego-like cubes; their stick arms move imprecisely without the fluidity of motion provided by elbows. The color palette is simple and vibrant; the dialogue is sparse and uncomplicated. The animations are, in short, characteristically kawaii. In this story, the children watch televised news announcements, first reporting that the stars in the sky have mysteriously disappeared, and then, as the Prince repopulates the heavens, relating that the stars are mysteriously reappearing. The children relay these reports to their mother, who responds with pat answers: "These kinds of things don't happen," and "That's nice dear." The son protests: "But … that's what they said!" Upon arriving at the space center, the father runs over to the family and announces that the mission has been called off because the moon has disappeared. This story is more prosaic than that of the King and the Prince, but it is nonetheless a version of the same story of the frustrations of childhood, of being ignored by one's parents. Following the game's success, a soundtrack was released by Columbia Music Entertainment, which earned "best-of-the-year" accolades from two major game review websites.7 Yu Miyake, the game's principal sound designer and composer of many of its songs, has said that the game's music was designed to be catchy and pop-oriented;8 it is, but it also still manages to convey a fundamental ambivalence that seems to be at the root of the game. 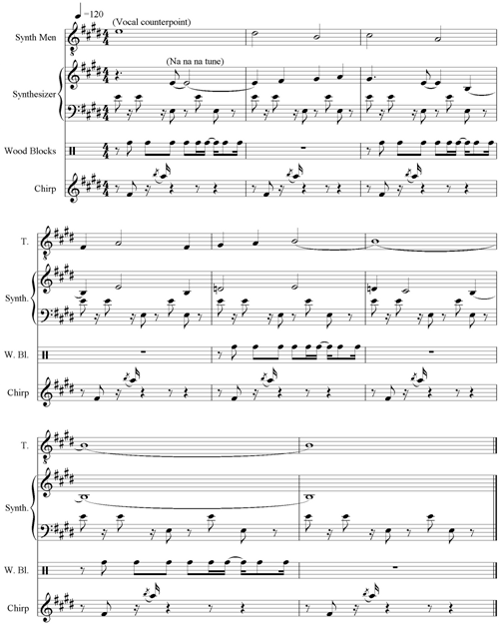 The title music is whimsical and tuneful, and its main theme appears in numerous variations within the songs of many of the individual levels. 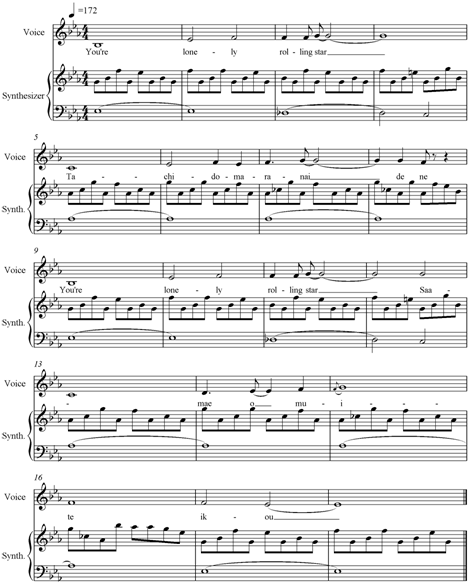 In some contexts, the recurrence of the title melody brings the player a sense of familiarity and unity, while other contexts vary the title song's setting and accompaniment in a way that drastically alters its mood. Karen Collins, game sound design expert and Canada Research Chair at the Canadian Centre of Arts and Technology at the University of Waterloo, recently published the first book-length critical study of video game sound and music.9 The first part is an overview of the history of game sound design, which Collins says began as an afterthought, scraped together by programmers with whatever bits of leftover hardware and memory remained at their disposal and developed into a sophisticated and crucial parameter of the modern game, which often includes full orchestral scores written by professional composers. Virtually all of the music in Katamari Damacy can be described as non-diegetic and non-dynamic (although the sounds of objects and people being picked up would be best described as diegetic and interactive, since they result from the player's activity, and the Prince is probably able to hear them just as the audience can). But non-diegetic video game music does not necessarily have the same effect as non-diegetic film music, an effect most clearly exemplified by the musical accompaniment to a later level in the game. In the first level, the player is guided gently into the game and is asked only to collect small items in one room of a house with no time limit. As the levels progress, time limits are imposed, and the player is asked to collect larger and larger items and explore larger and larger spaces. The player begins inside a house, moves out into the town, and eventually arrives out into the world in a challenging level with music that includes an unsettling reworking of the game's title theme. The musical alterations here create a sense of panic and anxiety in the player, confirming the heightened difficulty of the level and perhaps even impeding the player's concentration, further contributing to its challenge. While non-diegetic film music has the potential to effect an emotional response in an audience member, and the non-dynamic, non-diegetic music accompanying this level can also effect an emotional response in the player, a significant difference between the two types of music arises. A film will not change as a result of its audience's response. But the fact that a player's emotional response to a video game's music does have the potential to affect his or her performance, and the fact that the outcome of the level (success or failure) hinges on that performance, means that even non-dynamic, non-diegetic video game music can interact with its audience in a bidirectional way that a film score usually cannot. Although the tune is very simple, there are several details worth observing about the performance. The tune is sung by a solo male vocalist using a pinched-off vocal timbre and a lack of pitch accuracy: the d-flat, his highest note, is always sung under pitch. The impression is that of an amateur not singing to perform, but simply humming to himself to pass the time. The vocalized, percussive "dun dunga dun" adds to the effect of spontaneity, as does the "accidental" clink of a wood block on beat 4 of the third measure. The impression of candidness remains intact until the last measure, when the tune loops and overlaps on itself. A repetition of the tune begins at the same moment that the vocalist cadences on the e-flat pickup to the last measure. Thus, for one full measure plus an eighth note, we hear the beginning of the tune sung simultaneously with its close; the superimposition of the singer's voice onto itself destroys the illusion that this is a serendipitous overhearing of an unaware, untrained vocalist and reveals that this tune has been professionally produced and digitally manipulated. I would contend that the game is not concerned with an overthrow of the analog by the digital or with a resolution of any of the many contradictory themes it explores. Rather the game engages in play that enjoys and revels in contradiction. The space of acoustic and processed music opened in the title screen simultaneously reminds us of the processing capabilities of the console and the pedigree of video game music. The device is fully capable of processing and playing back a recording of a human voice, and thus it is capable of processing and playing back a recording of any acoustic sound; yet the composers self-consciously chose to emphasize synthesized instruments and sound effects that suggest a lack of technological sophistication. Having at the outset presented an "acoustic" recording of a human voice as "proof" of its capabilities, the game proceeds to present music that is overwhelmingly synthesized and often uses the bleeps and bloops of a bygone era of computer gaming as articulations and percussive effects. From the title screen, the player may choose to begin a new game and is then presented with the game's title sequence: cows are grazing in an empty field when a meteorite strikes the ground behind them. An enormous figure (the King) emerges from the background, causing the cows to scamper away. Storks fly from side to side; ducks on either side of the screen sing along with the music; the Prince dances on a rainbow; the King flies over the land scattering stardust that grows into colorful mushrooms;14 pandas dance and turn red; the King sits in a field playing a guitar next to the Queen, while the tiny Prince dances on his knee. Finally, the family drives off down a road lined with mushrooms, giraffes, and elephants toward a castle, a tableau resembling Main Street, Disneyland, U.S.A. The movie is colorful and kawaii, exuberant and overstimulating, and is accompanied by a frenetic, orchestrated version of the "Na na na" tune, including a synthesized bass line, backup singers, energetic percussion, and trumpets. Picnic kibun Feel so good ha! Don't worry; Do your best! (I'm in a) Picnic mood, Feel so good, Ha! Hand-knitted scarf and such, Oh, yeah! Wallow in ecstasy! Say good-bye, "Bye-bye!" Figure 3: Katamari on the Rocks, chorus. After viewing the title sequence, the player is placed in a tutorial level in which the King of All Cosmos instructs the Prince (and the player) on the game's controls. This level is accompanied by the hummed "Na na na" from the title screen, except digitally speeded up (with the effect of transposing it one half-step higher) and includes synthesized percussion (which now plays the rhythmic pattern vocalized earlier) and a synthesized bass line. Figure 4: "Na na na" tune with accompaniment. Whereas the title screen hinted at a contrast between processed and acoustic music, the tutorial's accompaniment makes the contrast explicit. The texture replaces the singer's vocalized percussion with a digital sound, and the synthesizer provides a harmonic accompaniment for the singer's tune with a timbre reminiscent of the 8-bit era of video games. The "Na na na" tune is the primary melody of the game's soundtrack, and many of the musical accompaniments throughout the game include some variation on it. The soundtrack includes pieces in a multitude of styles including jazz, rap, learned counterpoint, romantic piano, samba, marching band, and electronica. 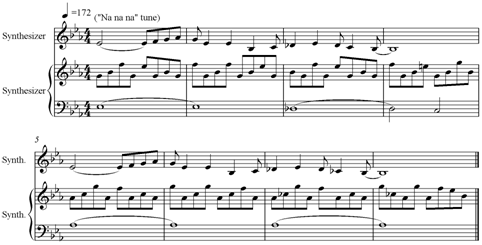 Not all of the pieces use the "Na na na" tune, but many of them do incorporate the melody as an idée fixe, including a song called Lonely Rolling Star. Like the tutorial music, Lonely Rolling Star juxtaposes a solo acoustic singer with a synthesizer accompaniment reminiscent of earlier games. In a sentimental, child-like Japanese style known as J-pop, the song capitalizes on its use of a kawaii aesthetic. For gamers who grew up in the early days of video game consoles, the accompaniment offers the sort of nostalgia for childhood that Allison argues is a key draw of kawaii. The vocalist uses a child-like vocal timbre, but which is purely manufactured: the singer is Saki Kabata, a professional Japanese recording artist who strives to sound young, sweet, and gentle. Like Katamari on the Rocks, the song's chorus offers warm encouragement with words that switch back and forth between Japanese and English. 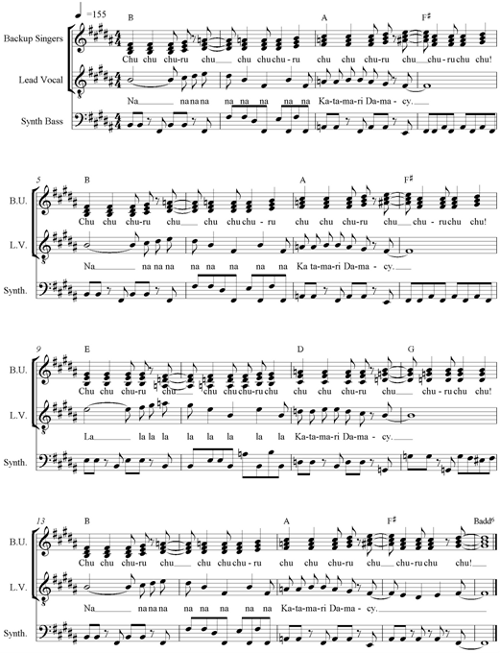 The song's final chorus is transcribed in figure 5. 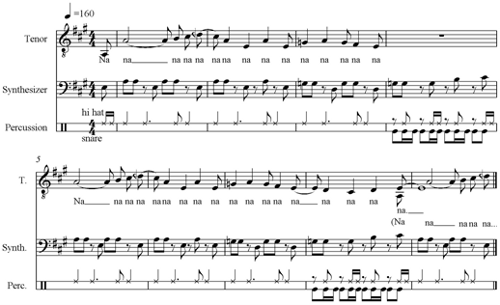 As the chorus ends, the vocals are replaced by a synthesizer playing the "Na na na" tune, as transcribed in figure 6 (the first measure of figure 6 in fact begins at the penultimate measure of figure 5). The appearance is unexpected and a pleasant surprise for the player, who by this point has heard the tune several times. The effect is somewhat nostalgic, which further contributes to the song's kawaii affect. Figure 6: "Na na na" tune in Lonely Rolling Star. While the use of the "Na na na" tune in Lonely Rolling Star is comforting and pleasing, the tune is used in another piece, Angelic Gifts, with a drastically different effect. Angelic Gifts accompanies one of the more difficult levels of the game, an unfamiliar, confusing space in which the Prince is tasked with creating a six-meter katamari within ten minutes. As the level begins, the Prince faces a row of bananas; the sensible strategy is to follow the banana trail, a strategy that is rewarded by the appearance of the King's head interjecting "BA," "NA," and "NA" at various intervals. However, once the Prince arrives at the end of the trail, there are no more clues how to proceed. The level is challenging on its own merits, but it is accompanied by a disorienting and overstimulating piece of electronic music, full of percussive digital sounds and effects, which both comments on and contributes to the level's difficulty. Although non-diegetic and non-interactive, Angelic Gifts differs from non-diegetic film music because it can potentially affect player performance, since the gamer, asked to contend with a challenging level, is also subjected to a disorienting, distracting, anxiety-provoking aural bombardment. Although we cannot know for sure whether the siren is diegetic (does the Prince hear it? ), it is an adaptive sound effect intended for the player. Though not strictly interactive, the siren has, as El Moco is correct to acknowledge, a visceral effect on the player and his or her approach to the game in the final moments of the level. The second musical detail that calls for discussion is a piece called Lovely Angel, which sounds each time the player successfully completes a level. At these times, the King of All Cosmos inspects the katamari, gives some information concerning its size and contents, and usually disparages the Prince for failing to create a better, larger, more beautiful star. The success screen is accompanied by a digitally-produced men's choir singing the harmonic progression outlined in figure 7. On the whole, the chord progression is simple and pleasing, consisting of a slightly modified VI-VII-I aeolian cadence common in popular music.19 Though not strictly triadic—the progression incorporates added notes and chordal sevenths—it provides a cyclical impression of stasis, increased tension, and then release. Notwithstanding the King's discouraging remarks, the player learns to associate this cadential passage, and specifically, the pleasure associated with the cadence's resolution, with success and reward. By the time the player first hears Angelic Gifts, he or she has already made meaningful associations with Lovely Angel, "Na na na," and the game's warning siren; Angelic Gifts unravels these musical associations. The piece begins with an unaccompanied steel-string guitar whose strings are loosened so that they strike the fingerboard, producing an unclean tone and a rattle. Figure 8: Guitar opening of Angelic Gifts. Figure 9: Principle rhythmic counterpoint in Angelic Gifts. The piece quietly alternates between its two harmonies with chordal and single-note articulations on a synthesizer that has undergone heavy digital processing, such as adding reverberation and timbral sweeps. Following the "broken" sound of the guitar, these digital bleeps and bloops, also reminiscent of early video game sound design, create a disorienting passage that serves as a sonic-sculptural showcase for video game sound effects. The Lovely Angel chorus appears approximately two minutes into the piece, now accompanied by the insistent clave rhythm, the disorienting sound effects, and a chirp that first leaps from c'' up to a'' and then down to a'. The chirp resembles an alert sound, similar to those heard near pedestrian crossings in some cities; it is difficult to escape the impression that the chirp signals a warning. Figure 10 is a partial transcription of this middle passage, although the texture is too thick and too full of incidental digital noises and effects to be transcribed accurately. Although the piece seems centered on e, and the Lovely Angel progression cadences on e, the passage destabilizes our sense of e as a tonic and the sense of cadential resolution that had previously characterized Lovely Angel. In the first chord, the c–a chirp sounds unrelated to the voices, as though it were an additional incidental sound effect. But when the voices change to the Am7 chord, the c and a of the chirp begin to sound like chord tones and continue to do so for eight measures. When the choir finally moves back to E∆9, which was the expected moment of resolution in Lovely Angel, the sense of cadence is lost: it is the choir that sounds as though it has moved away from the stability granted by the c-a chirp, rather than the chirp sounding like an intrusion of the wrong tonality. Furthermore, in m. 10 of the example, the chirp begins to sound twice as frequently, and in m. 12 reverberation begins to be applied, thickening over the course of the following four measures. By the end of the example, the chirp is the foregrounded element. The addition of strange musical effects and the strong emphasis on the chirp defamiliarizes and decontextualizes a chord progression that had initially signified success and closure. Immediately following the transformed Lovely Angel chorus comes the "Na na na" tune, which is similarly rendered unfamiliar. The most recognizable tune in the game now sounds in augmentation and in a timbre that emphasizes the out-of-tune seventh partial so that it is almost completely unobtrusive and at first may not even be recognized. The tune is further obscured by a foregrounded vocal counterpoint and the addition of a different chirp, this one leaping from f#' to an unpitched tone approximately a tenth higher. This passage is transcribed in figure 11. Figure 10: Angelic Gifts, reinterpretation of Lovely Angel. Figure 11: Angelic Gifts, reinterpretation of "Na na na." The middle of Angelic Gifts thus presents two familiar musical fragments in disorienting and discomforting contexts, both of which are purged of the meaning the game has invested in them up to this point. Whereas Lonely Rolling Star reprised the "Na na na" tune with cheery, nostalgic effect, Angelic Gifts obscures the tune in a wash of digital sound. Whereas Lovely Angel teaches the player to associate its chord progression with reward, the appearance in Angelic Gifts dismantles the reassuring cadential effect and replaces it with tonal uncertainty. Furthermore, both passages foreground alarm chirps, which, in terms of register, timbre, and rhythmic insistence, resemble the terror-invoking alarm siren that counts down the final seconds of each level. As Angelic Gifts draws to a close, the clave rhythm is now played by the timpani, and the chirp that accompanied the "Na na na" tune is foregrounded. Over time, reverberation is added to the chirp, and the texture becomes saturated with overstimulating sound effects: buzzers, car horns, beeps, clicks, and the like. For the final eight measures of the piece, all parts drop out except the primary rhythmic counterpoint played by the timpani and wood block, with the final downbeat articulated by the timpani. The track is about five minutes long, and the time limit for the level is ten minutes, so over the course of the level the player hears the piece twice. The timing of the piece allows for the thirty-second warning siren to begin sounding just at the height of the cacophonous swell of siren and alarm effects toward the end of Angelic Gifts. The siren, which up to this point has been entirely intrusive onto the music at each level, now complements the musical texture. 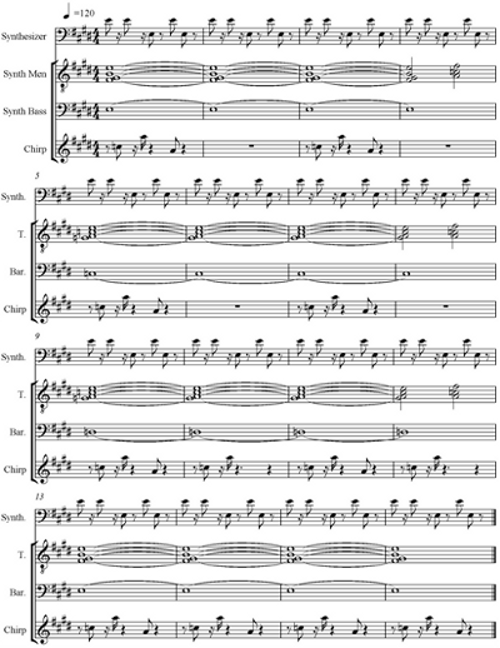 Moreover, the final seconds of Angelic Gifts actually foreground the game's siren: during the last eight measures of the piece when all of the noise has settled, the siren is heard as a "solo instrument" accompanied by the final, insistent pounding of the timpani and woodblock. In a move opposite the defamiliarization of Lovely Angel and "Na na na," Angelic Gifts for the first time in the game integrates the otherwise obtrusive siren at exactly the moment when the player is most likely to be struggling to find that one last object needed to enlarge the katamari to the required size. Angelic Gifts is a non-diegetic, non-dynamic piece of music, yet it functions differently than a non-diegetic passage of music in a film score. Although music at the cinema can move the audience, guide the emotional response to the story, and even instill a sense of panic and tension, the story projected on the screen will not change as a result of its score. Angelic Gifts not only provides a commentary on the level's challenge and instills a sense of panic and tension in the player, but also engenders a sense of panic and tension that can affect the player's performance by distracting or overwhelming his or her concentration. Non-diegetic, non-dynamic video game music therefore has the potential to facilitate and enhance the audience's experience in a more profound way than non-diegetic film music can. By teasing and tormenting the player, Angelic Gifts pulls back the veil on the game's ostensible cheeriness and makes explicit what might otherwise have been concealed underlying terror. We are reminded that the game's terror is not limited to the ticking of the level's clock, but that the central point of the game is a son's attempt to right the wrongs and win the approval and admiration of his uncaring, sociopathic father. We are also reminded of the terror that the quirky and kawaii, but massive and unrelenting katamari instills in the earthlings caught in its path. Perhaps Angelic Gifts also pulls back the veil on the seemingly benign, cheerful nature of the kawaii style itself. Allison argues that many consumers of kawaii goods reportedly find that these commodities have soothing, healing qualities, but kawaii has also been criticized for encouraging infantilism and regression in both children and adults and sending a message contrary to the social good.21 In fact, Katamari Damacy seems to enact this very debate through its outwardly cheery, exuberant presentation of a rather dark, troubling story. The game seems to revel both in child's play (push a ball to roll things up) and a childish mentality (a clump of Earthly objects one meter in diameter is sufficient to replace a star; the largest object in the night sky, the moon, requires the largest katamari to replace it; constellations can be replaced by gathering enough objects that resemble them). Yet cruelty emerges in the game when the Prince begins to roll up humans. The humans are terrified of the katamari and will attempt to run away from it when it gets to be too big; police officers will fire their weapons at it in an attempt to stop the destruction. People who are caught in the katamari scream and shout in protest: "What's happening to me?" and "No, don't!" The final level of the game takes place on such a large scale—the required size is 300 meters—that the Prince must roll up ships, buildings, and eventually all the land masses in sight in order to reach the goal. The final level of the game centers on the destruction of the planet and all life on it, yet this final level is the one accompanied by Katamari on the Rocks. The appearances of the "Na na na" tune throughout the entire game have pointed to its culmination on this last level, and there is a tremendous disconnect between the jubilation of the song and the devastation in the final events. The Prince's play, presented as cheery and childish, innocent and kawaii, brings about an Apocalypse. The cost of repairing the cosmos broken by the King's cavalier revelry ends up being the very lives of his subjects and the environment in which they live. And yet the game does not admit to an unhappy ending. In the final level, the island with the space center and the Hoshino family standing on it is one of the land masses rolled up by the Prince. But after the level ends, a final cutscene shows the family standing on the surface of the moon. "Wow…," the son exclaims, "We all got rolled into the katamari and now we're on a lunar family vacation. The stars sure are pretty." In the game's sequel, We Love Katamari, the population of the Earth, presumed to have been rolled up at the end of the previous game, is shown to have survived. Furthermore, in an ironic nod to the game's success, the earthlings in the game are all fans of Katamari Damacy and beg the Prince to make more katamari. Each level in the second game is treated as a special request on the part of one earthling. Katamari Damacy is a game that relishes its contradictions and refuses to resolve them – the analog feel of gameplay enacted through a digital medium, the intentional use of digitally-processed instrumentation in place of acoustic sound, the vibrant, childish, and exuberant stylization of a story about a callous King's terrifying mistake and even more terrifying solution. Katamari Damacy plays within the space opened up by these seeming opposites. There is no victory of the digital over the analog, the processed over the acoustic, the terrifying over the kawaii. The cosmos is not an orderly place to roll around in, but it can be fun to revel in the chaos. 1 The title translates as “Clump Spirit,” signifying enthusiasm in the sense of school spirit or a national spirit. 2 The author would like to acknowledge Darla Funk, James Wierzbicki, Haley Reale, and an anonymous reviewer for their insightful thoughts and contributions as this article was developed. 3 Katamari Damacy, Namco 2004. 4 Anne Allison, “Portable Monsters and Commodity Cuteness: Pokemon as Japan’s New Global Power,” in: Postcolonial Studies 6 (2003), no. 3, p. 386–387. 5 Allison, “Pokemon,” p. 391 (see nt. 4). 6 Allison, “Pokemon,” p. 384 (see nt. 4). 7 IGN.com, “Best of the Year 2004”; http://bestof.ign.com/2004/overall/14.html (accessed May 5, 2011); Gamespot.com, “Best and Worst of 2004”; http://www.gamespot.com/gamespot/features/all/bestof2004/day2w_2.html (accessed May 5, 2011). 8 Jayson Napolitano, “Katamari Music Maestro: Yu Miyake Interview,” in: Original Sound Version (December 15, 2009); http://www.originalsoundversion.com/?p=6189 (accessed May 5, 2011). 9 Karen Collins, Game Sound: An Introduction to the History, Theory, and Practice of Video Game Music and Sound Design, Cambridge MA 2008. By critical, I am distinguishing Collins’s book from technically-oriented manuals for the creation of game music. 10 Collins, Game Sound, p. 126 (see nt. 9). Similar terms can be used to describe sound effects. For example, the rumble of an earthquake would be an example of a diegetic, adaptive sound effect, since the character can hear the rumble, but is not directly responsible for it. By contrast, when Mario picks up a coin in Super Mario Bros., the accompanying ring would be an example of a non-diegetic, interactive sound effect, since the character causes the sound, but probably cannot hear it. 11 All musical examples transcribed by the author from the soundtrack album Katamari Fortissimo Damacy, Columbia Music Entertainment COCX-32760, and from the in-game audio. 12 McKenzie Wark, Gamer Theory, Cambridge, MA 2007. Gamer Theory is an unusual book that is part of a series underwritten by the MacArthur Foundation called “The Future of The Book.” Mimicking the medium of cyberspace, Gamer Theory has no page numbers, but all of the paragraphs are numbered, and all endnotes are referred to by their paragraph number rather than being serially ordered. The endnotes include not only bibliographic citations, but also pseudonymous comments by readers of an earlier, online-only version of the book, which resemble conversations that occur beneath an article on a webpage. Gamer Theory seeks to outline a field of inquiry to overturn the concept of “gamer theory” as a discipline concerned with interpreting and analyzing games and replace it with a discipline that employs conceptualizations and thought-processes developed through game play to analyze discourse outside the game. It should not go unnoticed that reading the book for the first time “plays” like a video game. The unfamiliar medium does not explain its internal logic, but the reader must explore the new rules of “book space” on his or her own to find out what is and is not possible. Wark playfully treats each chapter as a “level” that must be completed before moving on to the next (and subtly clues the reader in to this effect in paragraph 51). 13 Wark, Gamer Theory, paragraph 100 (see nt. 12). Success in each level may be somewhat less binary than Wark suggests. It is possible to complete the level by creating a katamari just slightly larger, somewhat larger, or significantly larger than requested. With practice, it is actually possible to impress the King of All Cosmos with a katamari so exceptionally large that his disappointment turns to praise; in some levels, this accomplishment is rewarded by unlocking “eternal mode,” which allows the player to traverse a level without any time restrictions. 14 The mushroom symbology used in a multicolor, fantastical title sequence provides a very strong flavor of psychedelia, which further contributes to the sense that the King’s “accident” was drug-induced. Perhaps this opening sequence is from the King’s perspective during the incident. It might explain why all the animals of the world happily sing along (“We were in all Nature’s embrace. We felt the beauty of all things, and felt love for all”), and, perhaps more interestingly, why the King, the Queen, and the Prince are presented as a happy family, when in the remainder of the game, the Queen is completely absent and the Prince is subjected to the King’s constant abuse. 17 For a formal analysis of gameplay optimization strategies in Katamari Damacy, see Gregory M. Zaverucha, “On the Complexity of Katamari Damacy,” Crossroads 14, no. 2 (December, 2007), Article 5. 18 Quoted in Wark, endnote to paragraph 78 (see nt. 12). 19 See, for example, Allan Moore’s analysis of Lady Madonna by the Beatles (“The So Called ‘Flattened 7th’ in Rock,” Popular Music 14, no. 2 [May, 1995]), p. 185-201, p. 191) and Walter Everett’s discussion of P.S. I Love You (“Making Sense of Rock’s Tonal Systems,” Music Theory Online 10, no. 4 [December, 2004], paragraph 12). 20 The author thanks François Fowler for his assistance in identifying the treatment of guitar and Glenn Schaft for his assistance in identifying the two fundamental rhythmic patterns. 21 For an overview of the debate, see Midori Matsui, “Beyond the Pleasure Room to a Chaotic Street: Transformations of Cute Subculture in the Art of the Japanese Nineties,” in: Little Boy: The Arts of Japan’s Exploding Subculture, ed. Takashi Murakami, New Haven and London 2005, p. 208–39. It can also be argued that the Prince is engaged in the very same kind of thoughtless and reckless consumption that kawaii goods are designed to promote.